So...I was bored. As usual. And while contemplating making a new Luna full body...I decided to refine the Igalima suit full bodies. So, changes include giving the rear hook(?) thing on her left shoulder a more refined edge; fixing the skirt front so its more centered; reshaping the green portion on her stomach; softening the edges where the white parts meet the green parts; outlining her breasts a bit more, since its essentially a skin-tight suit and would do just that; and adding some shading. . . . . . . .So. I'm going to have to edit a lot of my Kirika/Luna mugs/full bodies. I noticed that the hair doesn't really match, and I realized why. I used the wrong angle for it. Plus, in order to reduce how long her neck appear without collars, I also shifted the face position as well. That's about all for now. I like how the lowered face looks with the edits to the hair. So...first post in months. Decided to finish up Shad's family and redesign the short lived Luka. Outfit and pose was referenced from Theo from Grancrest Senki. Figured I'd do that that try to make a custom full body with his previous mug. So, in order by height from left to right, Lucille, Alice, Luna, Shad, and Luka. Luka had a growth spurt pretty young but also dies before even truly reaching adulthood. That's about all for now. I forgot I had this work in progress. I decided to post it, to hopefully spur me on to finish it. So, this is Luna wearing Kirika's gear from the Japan inspired event from XDU a few months ago. With some editting, I could probably turn this into a Sacaen outfit for Luna. Namely, replacing the body suit part with a sarashi, would probably be a good step towards that. But, in order to finish this, I need to do some work on the shoes. Its meant to have a sandle kind of look to it, vaguely anyway. That's all I'd need to do to get it up to speed. And I just noticed I had the old hairstyle version of Luna in the previous group picture. Got to replace that at some point. In other news, Photobucket's under new ownership so all my pictures are back! I don't have to rehost/repost a bunch of pictures now! So, in preparation for the Bernese Ball, I did some things. So first, Shad's moved onto his next messy hair style and an interim attire, his father's tattered coat. The next two attires here are Shad wearing his dad's formal clothes. 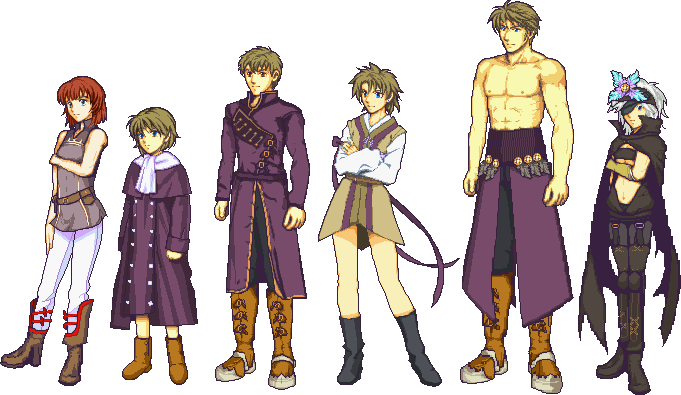 The two different cloak colors represent Shad and Daren respectively. Shad's final eventual outfit consists of the first cloak. The second cloak is Daren's cloak. And Maria will be tagging along in Bernese Ball, mainly because while I have npcs heading to the castle to man it and defend her, it would be way too convenient for them to show up before Bernese Ball. Anyway, this outfit of Maria exists already. She has a version with her long hair in the bow and a version just with short hair, but I figured it would be nice to hair a shorthair with bow version. New Stuff! I've been working slowly on several things, but I've completed a future outfit change for Carla Hyperion. This might be Carla's final outfit. It's inspired by Tales of Vesperia's Rita. I noticed her outfit looked a bit like how I'd wanted Carla's Sacaen outfit to be. So, when she returns to settle down in Sacae, she'd wear this instead of her old style. But that's not all! Full body(mostly WIP) with current and future hair cuts. Oh and I have this. 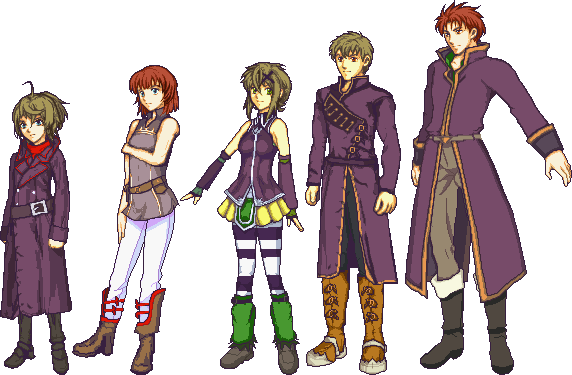 So, here's the current full bodies for all the living characters I have in the rp. You've got the younger ones in front with Alice, 15, and Maria, 10-going-on-11. Then Shad, 19. I think I have Carla around 26. Then its Lennox, again at 19. Then Illya at...29? I think. Lennox is so much younger then his future wife. Then you have Carla who is currently the shortest adult in the Hyperion family. At least she's taller than her cousin Illya. Shad's getting into shape. So, I'm going to, eventually, upgrade the rest of Shad's attires to this new form. So instead of building a body around a small bit of an FE sprite, I instead made a body for Shad using wrestler Lio Rush as a reference. He's the same height, so it worked out well. The only issue was that I didn't want to do his old undergarments, which I based from Dragon Age. So instead, I found a picture of those trousers and kinda haphazardly put them on him. The idea was to get a base for a new body more than showing what's under his clothes, so I didn't put much thought into it. This version is also up to date with Shad's current wounds, so the marks on his arms from the crossbow bolts are there, the cut across his arm and the scarred up left hand. Which I like far more than I did before. Shad's current build only really works for the old Shad. The Shad that lived in his father's shadow his entire life, living a secure life at home only occasionally fighting. This Shad, besides having to fight to survive and eventually take back his home, wasn't trained by Daren. He isn't purely a fencer anymore. He's a swordsman with a foundation based in fencing. His training was much different. Training with Lennox would put on more muscle than his intended training. And after getting his home back, he would have had the knights led by Marcus to train with. Plus, all the chainmail in walks around in under his coat can't hurt. Eventually, this should lead me to redoing Lennox as well, as he's someone benefits far better with the more impressive frame. Okay. So. Bored. So, new pants. New boots. Boots were based on Raven's, which I guess inspired aspects of the old boots. I think if anything, the legs came out much better in this new version than anything else. No belt, but that could probably be easily moved from one to the next. Whenever I get around to the next phase, his coats, I need the groundwork done first. The only thing that has been consistent in his outfits so far has been the same pants and boots. I wish I could say what inspired Shad's redesign of all things, but I don't know. Made a coat version for the new base. Needs a bit of work, but I'm happy enough with it for the moment. So, I finally got Shad to a very easy to adjust form, so expect more outfits...the none of you who comment. I refined Shad's coat some more, adding cuffs, changing the trim to a silver color, changing the shading on the overlapping flap. Next attire on this list is just a shirt with the cuffs. I'm probably going to try to add something to it. Includes different color pants and boots. Might change the boots, but that's all for now.